Use different shaped cookie cutters to make for any holiday! This month the theme for our blog is all about saving money. If you have a pet, you know that you spend so much extra money on food, treats, and toys. 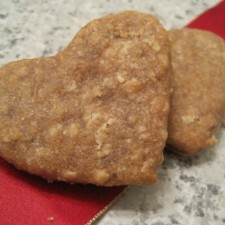 So why not make your dog homemade treats with ingredients that are already in your pantry. I made them recently as a Christmas treat for our German Shepherd and he couldn’t get enough of them. He would have eaten the whole bag all at once if we let him. 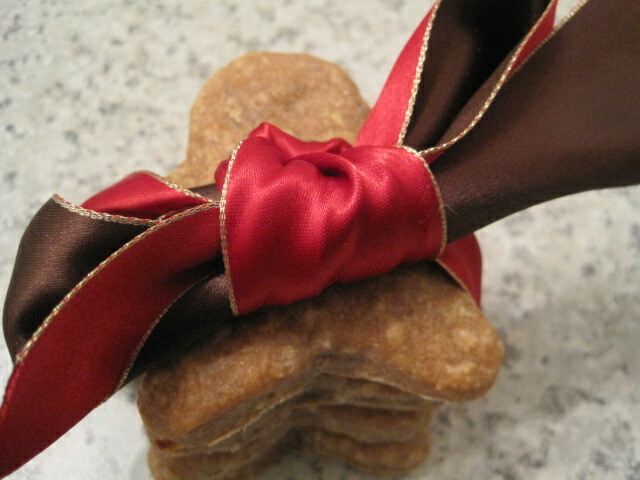 My treats turned out pretty big, but for smaller dogs you can roll them thinner and use smaller cookie cutters for a petite treat. Preheat oven to 350 degrees. Whisk together peanut butter, honey, coconut oil and chicken broth. In a separate bowl, combine flours and oatmeal. Mix dry ingredients into wet ingredients. Place dough on flour dusted surface. Roll or press dough out to about 1/4” inch thick. Use a small cookie cutter to cut out cookies. Roll out leftover scraps and cut out as many as possible. Put cut out cookies on a parchment lined baking sheet. Bake for 14-16 minutes. Transfer to a cooling rack. I’m so interested in the beauty choices I can try with coconut oil! It’s hard to believe this is for the dogs – sounds good. LOVE THIS! im going to try with the sample i request for my two fur babies! Yay….. I look forward to trying this!!! 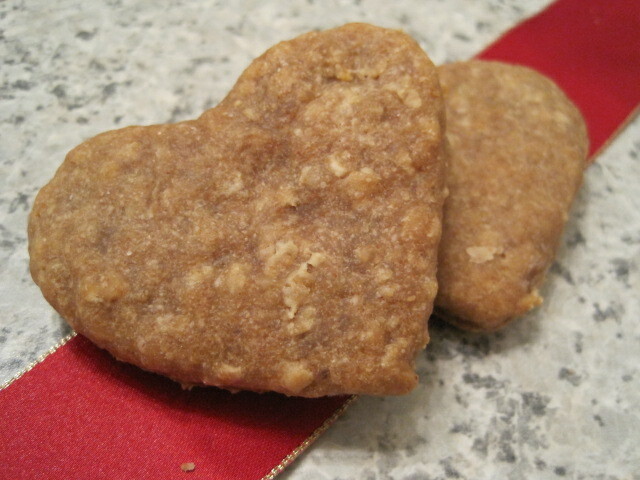 I love making my own dog treats and would love to try making them with coconut oil. I have been wanting to try coconut oil but the price has stopped me. This recipe sounds great, I’m going to make them for my dog! Going to try this for sure. Thanks for offering a free sample. Can’t wait. Awesome! I’d love to share the benefits of coconut oil with my puppy! I would love to try a sample as well as this recipe! 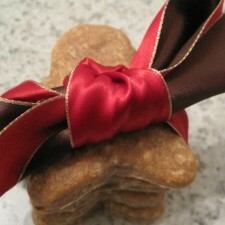 Great recipe for nutritious dog treats. I wonder if this would work with rice flour or some other substitute. Dogs can’t digest wheat flour, and mine is allergic! I’ll try it with something better for him! Sounds like a great recipe otherwise! Very cute! Angie I was wondering if you had tried the recipe with the rice flour? My dog also can’t have wheat. Wonderful blog with useful articles.I would like to get sample of coconut oil. Fizzy will LOVE THIS!! Thank you!! I’m always looking for healthy options for my dogs! I’m definitely going to give this recipe a try. I can’t wait to try some of these unique recipes!! Even the dog treats for my dogs!! They deserve great taste too!! I have been reading of the benefits of coconut oil and look forward to trying your product! If i got a sample of kelapo I would so make these. I foster animals & would love to try this with my foster dogs. Thank you! What an interesting application for coconut oil. Who thinks of this stuff? I’ve got to try this one, thanks for the great ideas!! We just got a new puppy for my daughter’s birthday, and having been looking for a good recipe for homemade dog treats. Can’t wait to try this! Looking forward to trying coconut oil. I would love to try coconut oil! Unfortunately I have never seen it in stores! I’m going to make this for our dog. Like Angie, I think I’ll skip the wheat flour and use a gluten-free flour instead. I cannot wait to make these for my dogs and granddogs. Definitly going to try this! Toby and Lily will love them! I live in Windermere ,Fl. Where can I find your product? Great recipe. My dogs love these treats! Thank you!! I won’t put whole wheat in these cookies. I’m putting in Brown Rice flour. So much better for our dogs. I won’t even eat whole wheat. How did they turn out Debbie? Thanks for the tip! My dog is allergic to grains, so I would like to try these with oat flour or the brown rice flour. You may want to contact your vet to see if this would be harmful towards your dog’s condition. Hope you were able to tweak the recipe. How do you store these and how long can they be stored? You can store these in the refrigerator or at room temperature. I would say keep them no longer than two weeks. Hope you liked them! Do these need to be refrigerated after you make them? Hi Ella! You can store these in the refrigerator or at room temperature. I would say keep them no longer than two weeks. I made these and my dog loved them. I switched most of the flour to oat flour to minimize the wheat and it worked great. My kids also thought they looked tasty but I made them separate cookies!! I’ll be making these again for our pup. Great recipe.